Paragliding is the simplest and most serene way to fulfill humankind's oldest dream - free flight! The pilot jogs down a gentle slope and glides away from the mountain. There is no free-falling or jumping off of cliffs. You do not need any experience or knowledge, just the desire to fly and follow your instructor's guidance on positions for takeoff, time spent in the air and landing. 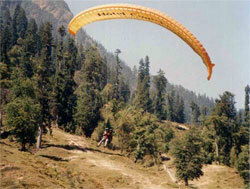 Paragliding in Nainital has evolved steadily over the few years. The paraglider is a wing, rather than a parachute, having the ability to glide forwards rather than to simply descend vertically. Launching a paraglider requires a short run along a gentle slope. Once in flight, the pilot steers the paraglider and controls where he wishes to go. The paraglider flys at a speed of around 35 - 40 kph / 20 - 25 mph. High Flying: 3000 ft above sea level. Medium Flying: 2000 ft above sea level. Fly time for normal ride would be 4 to 10 mins depending on wind conditions. High flying will be around 20 to 40 minutes depending on wind conditions.